If you are looking for heavy machinery with the capability to work in the most demanding of situations, then the Cat medium wheel loader is just for you. ACERT technology engine increases horsepower and maintains durability of the machine. Load-sensing hydraulic system boosts cycle times. The new H series of medium wheel loaders from Cat are unmatched in the industry for operator comfort and efficiency. With state-of-the-art electronics and hydraulics in place, your manual work-force has to do the minimum. 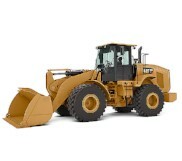 Increase output and efficiency and make the most of this heavy machinery on your job site. Now available for rent exclusively through Al-Bahar, you can find the medium H series wheel loaders in UAE, Kuwait, Oman, Bahrain and Qatar. Built strong and tough, the Cat medium wheel loader is perfect for the Middle East and can withstand all conditions. With full visibility access to both front and rear ends of the machine, your operator can function with ease. Fill in our contact form to learn more and a specialist will get back to you shortly.